The MVP Sport | Marathon Orthotics, Inc. The MVP orthotic has been worn by some of the most famous athletes in professional sports and the Olympics. 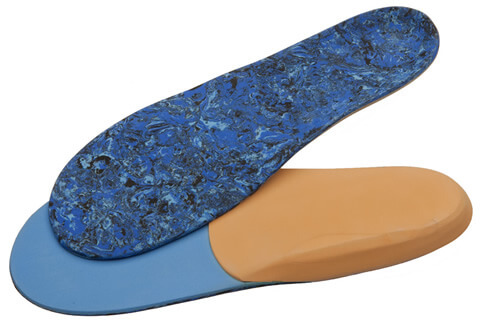 This is one of our most popular and versatile orthotics. It can be used for general heel pain, Plantar Fasciitis, Posterior Tibialis Tendon Dysfunction (PTTD), Excessive Pronation, Excessive Supination, off-loading any bony prominence and many other foot problems. Typically a MPJ-Length shell is ordered to reduce bulk in the forefoot. We recommend a sulcus or full length shell if forefoot cut-outs are needed, or if varus or valgus wedging or posting is required. A full length top cover is almost always ordered with any length shell. As always, Marathon Orthotics, Inc. does not charge extra for heel lifts, additional layers of cushion, cut-outs (depressions), etc. Many clinics simply write MVP or you can write 6D in the Catalog Choice area of our prescription order form.